Ask any Google Pixel 2, Pixel 2 XL, Samsung Galaxy Note 8 or Galaxy S8 user about their thoughts on the Huawei Mate 10 or the high-end Mate 10 Pro and even before they experience the phone, most will certainly be against it. One of the reasons that usually comes out when arguing against Huawei phones is that the company’s EMUI skin is heavy and thus makes the phones less snappy when compared to, say, the Google Pixel 2 and Pixel 2 XL. There have also been genuine concerns about Chinese OEMs and how they handle user data, but Huawei has always denied these claims. The speed at which software updates are rolled out is also another genuine concern, but with the Huawei Mate 10 comes Project Treble, which means this issue has – hopefully – been addressed. With the Mate 10, the Chinese OEM has without a doubt addressed these concerns. The device is gorgeous and even though not Samsung Galaxy S8 or Galaxy Note 8 gorgeous, you’ll definitely enjoy the feel of the phone in your hand. Like the aforementioned handsets, it’s huge in size and unlike previous cases where Huawei went for below par display quality, this year’s Mate 10 is on level terms with other flagship phones on the market. Interestingly, the Huawei Mate 10 has the same display size as the Google Pixel 2 XL, but the latter is a whole 7mm taller, probably due to the inclusion of dual stereo speakers. 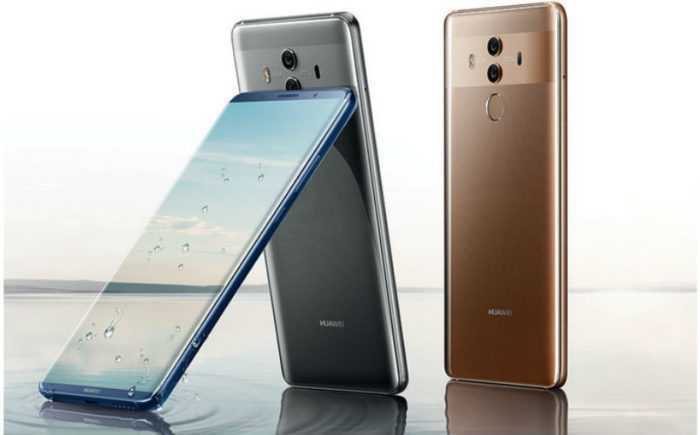 Still, Huawei somehow found enough space to include a front-mounted fingerprint scanner, a feature that is slowly fading away as companies turn to 18:9 display screens. Oh, the Mate 10 still has the traditional 16:9 aspect ratio, which should be a welcome for some. The debate about which is the best between Snapdragon and Kirin processors can only be answered with real life usage of the chipsets, but benchmarks have always been there to give us a rough idea of what to expect. The latest Snapdragon 835 has proven to be a popular choice in the flagship market, but like Apple, Huawei usually opts for in-house chipsets, the latest being the Kirin 970. In the many benchmarks that involve flagship Kirin and Snapdragon chipsets, the former has on most occasions come out on top. In addition to promising a lot through benchmarks, the Kirin 970 doesn’t disappoint in real life. The Huawei Mate 10 is as snappy as you would expect and given the so-called heavy skin, this says a lot about the Kirin 970, which the company boasts as the first to be based on AI. Whether you are switching apps, streaming videos, playing intensive games or even multitasking, the 4GB RAM that accompanies the Kirin 970 delivers the best results and as you would expect, the 64GB of storage is expandable via a microSD card of up to 256GB. The Huawei Mate 10 Pro has been rated second to the Google Pixel 2 by folks at DxOMark, earning a score of 97. The camera inside the Mate 10 Pro is the same as the one used on the standard Mate 10, which means the phone has one of the best cameras on any smartphone. Both 20MP and 12MP lenses used on the back of the phone are optimized for low-light performance thanks to the wide f/1.6 aperture, but the second sensor also offers 2x lossless zoom. Other camera features include optical image stabilization, PDAF, dual-tone LED flash and 4K video recording. As for the front, you get an 8MP lens with f/2.0 aperture, which is pretty much a good performer in low-light conditions. Perhaps the biggest selling point of the Huawei Mate 10 is the battery. The phone comes equipped with a monstrous 4000mAh unit and to makes things even better, juicing it up won’t be long thanks to the supported fast charging technology. Like many other 2017 flagship phones, the Mate 10 has a USB-C port, but you still get a 3.5mm audio jack, something you won’t find on the Mate 10 Pro. Surprisingly, the phone still comes with the old Bluetooth 4.2 instead of the new v5.0, but this shouldn’t be a big deal. If you have used Huawei phones before, you’ll agree that the new EMUI 8.0 skin that runs on top of Android 8.0 Oreo out of the box is the best the company has had in years. It’s true the EMUI skin has always been heavy and although v8.0 still shows some of these traits, the powerful Kirin 970 and 4GB RAM easily negate this shortcoming, leaving you with one of the snappiest phones money can buy. Speaking of money, the Huawei Mate 10 still stands out as one of the more affordable flagships, at least not when compared to the OnePlus 5T, which is actually a flagship killer. Priced at about 700 euros, you’ll be getting a device that is powerful and includes all the bells and whistles of a flagship phone. There are rumors that the high-end Huawei Mate 10 Pro will be coming to the U.S. via AT&T, but we still can’t verify any of it. Hopefully, this will be the case, but still, getting one from overseas shouldn’t be a problem at all. Despite how good the Huawei Mate 10 is, the phone will probably get few likes compared to the likes of Google Pixel 2 XL and Samsung Galaxy Note 8. Perhaps Huawei is just underrated on these sides of the continent. Previous Previous post: Why Apple Didn’t Patch it if They Found the MacOS High Sierra Flaw Weeks Ago?